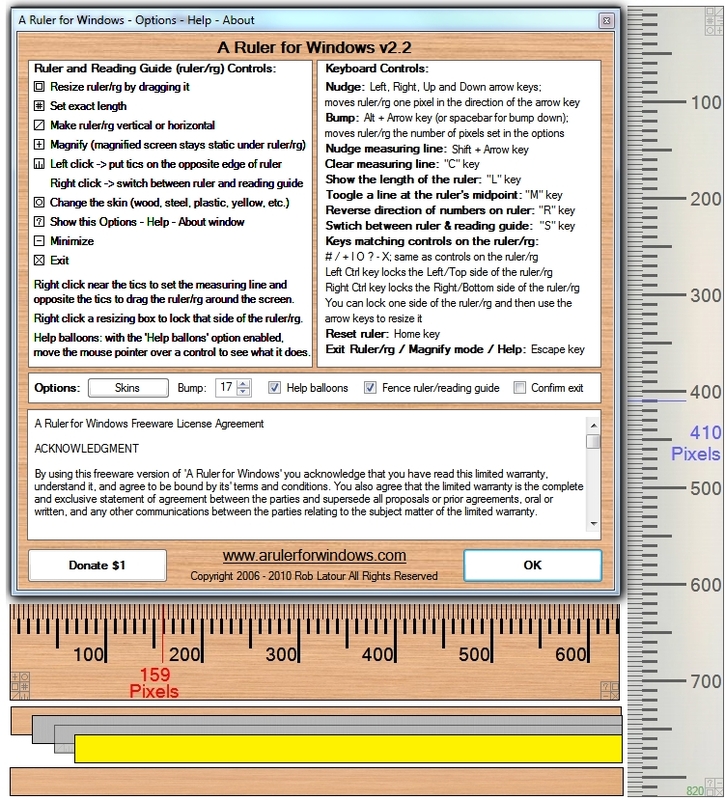 A Ruler for Windows is a free on-screen pixel ruler and reading guide. A Ruler for Windows provides you your choice of a woodgrain, stainless steel, clear see-through plastic or yellow construction ruler and reading guide - plus you can design your own custom skins. A Ruler for Windows is fun to learn and very easy to use. You are welcome to use A Ruler for Windows for free on as many computers as you would like. A Ruler for Windows lets you layer multiple online rulers / reading guides on your screen at the same time. Each ruler / reading guide can be flipped horizontally or vertically, resized to an exact length or resized by dragging it to a desired length. The numbering on the ruler can be reversed and the ruler's length optionally displayed. Ticks can be placed on which ever long edge of the ruler you prefer. You can click on a tick to have a measuring line automatically drawn at an exact location. Special 2x, 3x, and 4x modes allow you to take a snapshot of your primary screen and magnify it to more easily measure between very fine points. As you can see through the clear plastic ruler / reading guide you can even type under it. Qweas is providing links to A Ruler for Windows 2.4.6 as a courtesy, and makes no representations regarding A Ruler for Windows or any other applications or any information related thereto. Any questions, complaints or claims regarding this application A Ruler for Windows 2.4.6 must be directed to the appropriate software vendor. You may click the publisher link of A Ruler for Windows on the top of this page to get more details about the vendor.